Product prices and availability are accurate as of 2019-04-19 06:11:16 CDT and are subject to change. Any price and availability information displayed on http://www.amazon.com/ at the time of purchase will apply to the purchase of this product. Home-based businesses are estimated to be a $427 billion-a-year industry. In recent studies it was found that as many as 105 million people in North America alone were working at home. 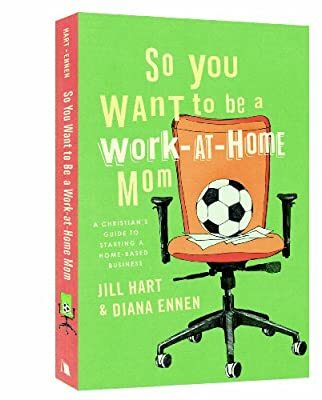 Considering this information, it is obvious that home-based businesses can be successful-and authors Jill Hart and Diana Ennen will help you succeed with your own.So You Want to Be a Work-at-Home Mom details all the basics of starting a business in a spiritual, motivational, and comprehensive manner. From deciding what type of business to start to keeping your family and faith first, this helpful tool details every aspect of establishing a business. With proven success tips utilized by the authors and others who own work-at-home businesses, this inspiration approach will provide you with the resources you need to start your own home-based business.So You Want to Be a Work-at-Home Mom includes:Detailed information on types of businesses to startIdeas and assistance for setting up, operating, and marketing your businessDefinitions and descriptions of work-at-home terminology and processesHelp for developing your Web siteExplanations of the business ’nuts and bolts,’ including bookkeeping, taxes, and moreClick here to listen to an interview with the author.